Drafted in the first round of the 1958 draft by the Chicago Bears, Chuck Howley is most well remembered as a member of the Dallas Cowboys where he was named MVP of Super Bowl V. It appeared that a knee injury had ended Howley’s career early but he made a comeback in 1961, to which the Bears traded his rights to the Cowboys. 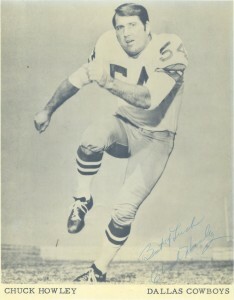 Chuck would play the rest of his career for the Cowboys through the 1973 season. A 6 time Pro Bowl selection and 5 time AP, Howley is of a rare group of linebackers with at least 20 sacks and 20 interceptions. Since retirement he has bred horses outside of Dallas, Texas at Happy Hollow in Texas and has been inducted into numerous Hall of Fames including the West Virginia HoF and the Cowboys Ring of Honor, however he has not been inducted into the NFL HoF.